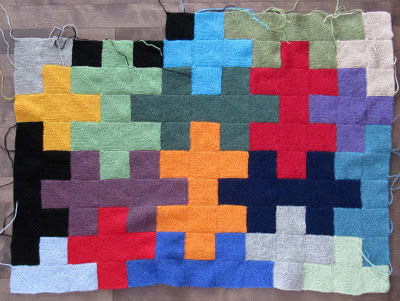 Until my Christmas knitting is finished I'm knitting only one block a day on my Jigsaw afghan. I've just passed the halfway point, not counting the border. The turquoise block at the top is the middle square. I love seeing the puzzle pieces forming. Just a reminder that the pattern and a knitalong group for the afghan can be found on Ravelry. Speaking of Christmas, I finished another one of the projects. I'm going to block it today and will be posting the details and pictures in the next day or two. Maybe I'll finish my Christmas knitting in time. There's hope!